Let me offer some counterarguments: Scooters get people from point A to point B really quickly, without firing up a carbon-spewing engine or breaking a sweat. Scooters are easy to ride—if you can walk, you can probably ride a scooter—and have the lowest barrier to entry of any shared mode of transit. Mock if you want, but not everyone wants a workout on their way from one meeting to the next. Previously, people who prefer a cardio-free commute would have jumped in their cars. Now, they can make those short trips on their zero-emission scooters instead. Critics point out that many of the environmental claims from scooter proponents (usually focused on the reduction of carbon emissions) remain unproven. Fair enough—it’s possible that a significant number of the thousands of people using scooters to get around Austin, San Diego, and Washington, D.C. would have otherwise used public transportation, walked or ridden bikes to their destinations. But it's almost certain that scooters take at least some vehicles off the road—and doesn't every little reduction in emissions help, particularly in a region where transportation is the single largest contributor to greenhouse-gas emissions? You know what else we don’t know about scooters? Whether they’re actually as dangerous as opponents claim. Durkan cited unspecified mayors and cities that are turning against scooters, but the truth is, no city has had scooters on its streets long enough to have any real idea whether they’re more dangerous than walking, or biking, or—for that matter—driving a car. Anecdotal evidence suggests a rise in emergency room visits for injuries sustained by people riding e-scooters, but that’s not the same as statistical proof of danger: The rate of injuries on e-scooters used to be zero, because they weren’t legal in any city, and now it has risen. Similarly, a few people have died riding shared e-scooters. That represents an increase in deaths of hundreds of percentage points, because the previous number—when scooter-sharing didn’t exist—was zero. One frequently cited Washington Post story claims that there has been a “161 percent spike in [ER] visits involving electric scooters.” Buried in the story is the fact that the increase, at a single hospital in Salt Lake City, was from eight injuries to 21. Cyclists sustain a lot more injuries, and are more likely to be killed while riding, than scooter riders. That isn’t an argument to ban bikes. It’s an argument to make roads safer. Durkan is right about one thing: Scooters are fun. 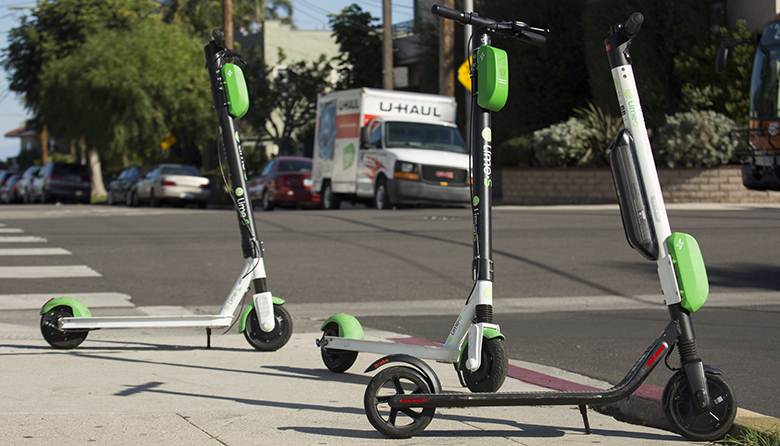 Recently, I was in Portland, where scooters are allowed in bike lanes and on city streets, and I warily agreed to try using the Lime scooter my housemate brought home with him one afternoon. After a shaky start, I got the hang of it, and before long, I was zipping all around the city—from the conference venue, to my Airbnb, and to meetups everywhere in between. When there wasn’t a scooter around, I used one of the many bikesharing services. My rental car—which I’d driven down from Seattle and planned to use when I needed to get across town fast—sat in its spot on the street for four straight days. Why drive when there are so many better alternatives?